A January 2016 panel discussion brought five notable BC Law Alumni to campus to discuss their experiences in running for office. The key takeaway? It’s not an easy path for anyone, but the benefits of serving the public good are worth the fight. 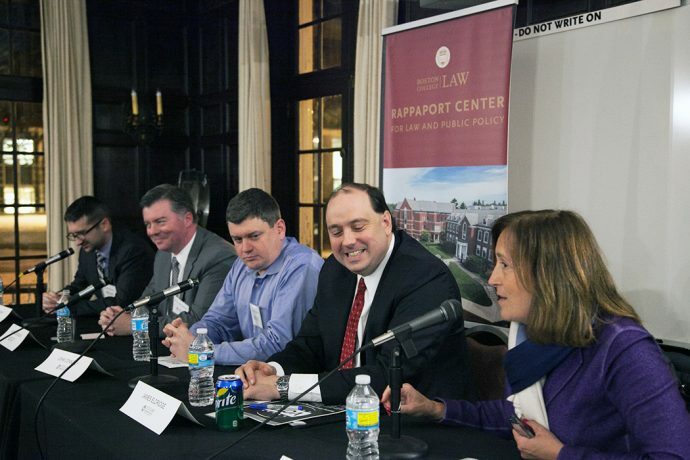 The panel, sponsored by the Rappaport Center for Law and Public Policy at Boston College Law School, included (in photo, from left to right) panelists Bryan Barash ’13, Newton Charter Commissioner; Matt McDonough ’02, Register of Probate for Plymouth County; John Connolly ’01, former Boston City Councilor and 2013 City of Boston mayoral candidate; Jamie Eldridge ’00, State Senator; and State Treasurer Deborah Goldberg ’85 as moderator. “The panelists offered real insight into the nuts and bolts about running for office and the difficult realities that come along with being a public figure,” said Max Calderon ’16, who wrote about the event for the BC Law Impact student blog.